Show off your excitement for the last season of Game of Thrones from your morning coffee to your evening hot chocolate with this great Game of Thrones travel mug! Featuring Tyrion Lannister’s famous quote “That’s what I do, I drink and I know things”, there is no better mug to drink your coffee from. 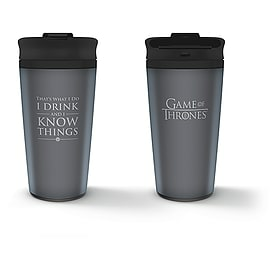 Gear up for Game of Thrones Season 8 and shop the “I drink and I know things” Travel Mug today, at GAME. This fantastic piece of Game of Thrones merchandise is a dark grey travel coffee mug. One side features Tyrion’s famous quote from season 6 “That’s what I do, I drink and I know things” in a light grey text. The reverse side features the Game of Thrones TV Series Logo. 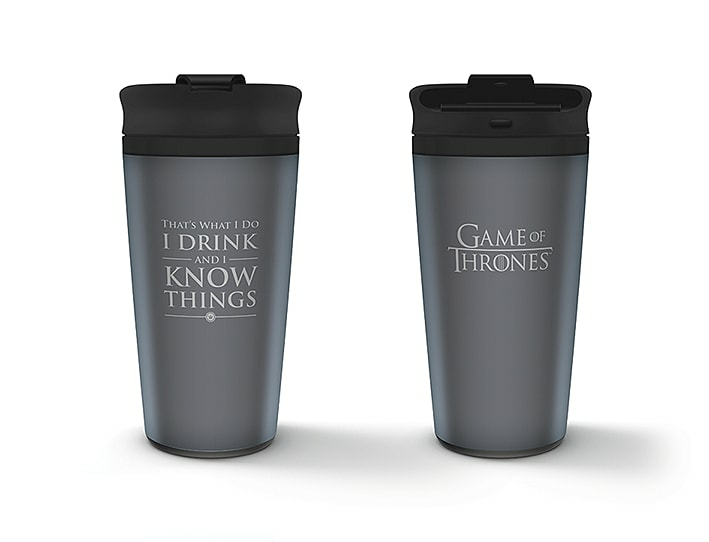 With a black twist cup lid and thermal technology, this travel mug is perfect for keeping your drinks warm and your love for Game of Thrones alive!